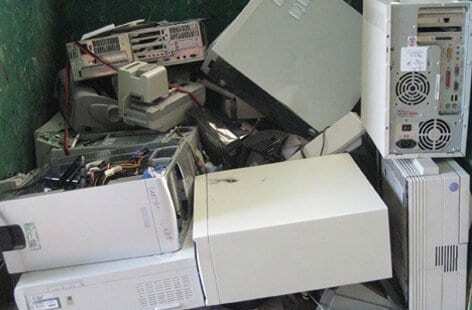 Government regulations dictate that the Waste of Electrical and Electronic Equipment (WEEE) must be treated in a different way to furniture, when recycling. Our specialist partners are registered with the relevant bodies to ensure compliance and can provide secure destruction certificates, as well as the obligatory recycle documentation. In order to cater for all your business and office recycling needs, we recycle all types of used IT equipment, including PCs, monitors, printers, telephone systems, photocopiers and other computer peripherals. We also collect audiovisual equipment such as televisions, stereos, VHS and DVD players. From the 16 July 2005, some types of Waste Electrical and Electronic Equipment (WEEE) has been classified as Hazardous Waste. These include TVs, computer monitors and fluorescent tubes. Hazardous Waste needs to be recovered or disposed of at properly authorised sites and can only be transported by registered waste carriers. All office equipment that we receive is either refurbished or recycled. Our aim is to try and refurbish the equipment and, if this is not practical, we ensure that it is fully recycled. We can destroy computer hard disks that hold sensitive data ensuring that the computer maybe re-used. We supply a network of computer refurbishers (some of which supply the Third World) and computer equipment dealers. Hazardous waste is sent to an Authorized Treatment Facility (ATF). We do not send anything to landfill, in accordance with the WEEE directive and our strict environmental policy.